I remember when I learned my house was getting torn down. It was June 11, 2008, an exceptionally hot summer day. Flies were buzzing lazily around my head, and the shadows were as sharp as knives. The women of the village, normally a chattering bunch, were conspicuously silent around the corner from my country home, hidden from view by the plum trees. I shuffled over to see what was going on, when a flimsy blue Chery QQ flew around the corner and forced me back. The Chery jerked to a stop an inch from my bamboo clothesline. A man stepped out and looked around. Secretary Luo, one of the ladies breathed as he stepped out into the sunshine. In China, secretaries are the bosses and a boss in rural China is hard to mistake for anything else. This man fit the description as well as any boss I had ever seen. Secretary Luo was portly, with shiny black shoes and a striped Burberry polo shirt. He had a thick head of black hair, a small smile on thick lips, and cigarette stained skin. His small eyes were hidden from view, but took in everything. A driver, tall, lanky and balding, trailed the Secretary around nodding to himself and clutching a black leather bag with both hands. I followed them to where the women were gathered in a small group, nervously waiting for Secretary Luo. These were strong women, who worked alongside the men in the rose fields and gardens, tilling earth and sweating under the Sichuan sun. Women with powerful legs and gruff loud voices, who routinely invaded my courtyard, kitchen, home and bathroom to berate whatever it was I was doing. But here they were, cowering with strained smiles and fearful eyes. They rocked their babies and nodded as Secretary Luo spoke. “We’re going to turn this place around, make it modern, you understand?" The women nodded in unison. He swiveled on his heels and took in the small village. “We’ll tear it all down in August." The women nodded as if he had mentioned the unusually clear skies on such a hot day. The lanky driver stood to the side and shuffled some papers, then looked up at no one in particular and licked his lips. With one more encompassing glance at the village and the women, Secretary Luo turned and strolled to his car. With that they slipped back into their little blue Chery and sped off down the one-lane road that led through the village, forcing a vendor and his cabbage-laden motorcycle off to one side. The vendor narrowly missed the vegetables planted along the road and drove by, calling for us to “buy cabbage” in a nasal tone that carried across the sunbaked fields. I could still hear him as I turned to my neighbours to confirm what I had just heard. But they were pre-occupied. Their homes were being ripped out from under them in less than three months and I could see shock spread across their faces in the noonday heat. 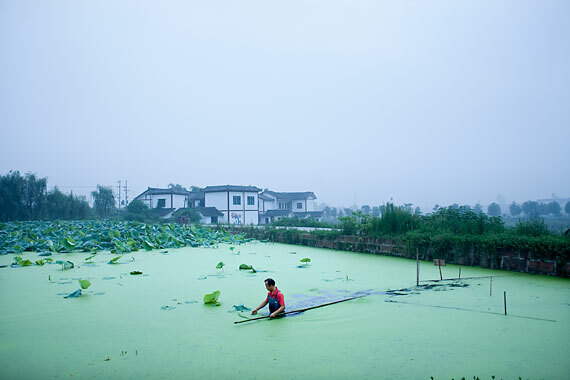 Chengdu is the self-proclaimed birthplace of nongjiale, which translates literally as “farmhouse happiness” but has now come to define both Chinese-style bed and breakfast inns, and the idyllic country life that wealthy urbanites yearn for. The recent rise of villages of farmer-run nongjiale flourishing alongside massive state-sponsored flower markets is nationwide, but it can be traced back to a genesis here, when farmers realised that by planting flowers and catering to city dwellers they could make ten times what they could growing traditional crops. That’s how places like Sansheng Huaxiang ("Three Gods Flower Village") came about. 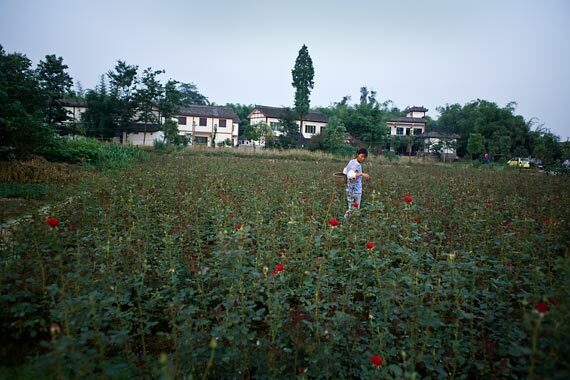 A collection of small villages on the southeast outskirts of Chengdu, in 2006 the municipal government designated Sansheng Huaxiang an official flower-growing hub.The farmers had already changed much of their crop rotation to reflect the market – cabbage plots and cornfields became rose fields and pear orchards – and those with the means to do so turned their homes into B&Bs for the avant garde middle classes who arrived in droves after 2006. We started calling it Flower Town. When I moved to Flower Town in September 2007, I ended up in Unit 4 of the 10,000 Fortunes neighbourhood of Hetang Yuese village. The village ringed a large pond that attracted couples and photographers in the summer and lotus root hunters in the winter. The houses overlooking the pond all had a fresh coat of paint. The further you moved away from the pond, the more mundane the homes were. At some point they reverted back to standard country fare – raw concrete walls, a patchwork aluminium roof held down by bricks, and vegetable plots manning the perimeter. Unit 4, a collection of 12 homes with about 50 people in total, sat on a small rise set back from the pond, surrounded by rose fields brown and still in the summer heat. Short, bow-backed men and women would wander from one plot to another, adding water from buckets suspended on a bamboo pole, pulling out weeds. Everyone was related, by blood or by marriage. About half of the village worked exclusively in the fields. The other half rented their plots out and worked in factories in the city. No one in Unit 4 operated a B&B. On the far side of the rise was the hamlet’s own tiny lotus pond, choked with mud and home to a family of geese. I could watch the geese from my upstairs window. Behind my house was a bamboo grove, with massive hornet-coloured spiders hanging in the upper reaches, and bats at night. It was a quiet place, and one of the few spaces in the village not covered with litter. A narrow concrete path led through fallow fields, around the rise, and over a tiny creek to the bus stop that connected Unit 4 with the wider world. On a clear day, I could see advancing columns of apartment complexes and office buildings. Most of them were empty shells, waiting for the urban wave to come crashing in and fill them up. Farmhouses in China are not much better than empty shells themselves, and those in Unit 4 were no exception. Most were built of concrete and plaster, with no insulation and not a single straight line in the whole building. The windowpanes were thin and rattled in their ill-fitting frames. A typical country family doesn’t splurge on furniture, and keeps warm by bundling up inside, watching television and sipping hot water. 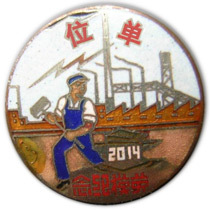 Wang Meijie, my next door neighbour, worked as a secretary in the nearby Pride cigarette plant. Her husband worked in a factory that built parts for motorcycles. Their 12 year old daughter, Tiantian, was the first ambassador of the village to greet me when I arrived that September, ten months before Secretary Luo's fateful visit. 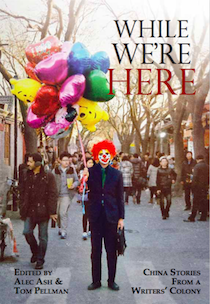 She stepped across her mother’s green rows of garlic and spring onions and demanded to know what in hell I was doing in her village, far away from all the other foreigners in Chengdu. I told Tiantian that I was here to finish a book and wanted to get away from the city. She sniffed at this, then went to inspect my furniture. I had none. I was so broke at the time that after paying three months rent for the place ($400) I had nothing left for furniture or appliances. Or food, for that matter. I had one rickety table, a heater and a few plates that I had cobbled together from friends. I also had a bag of rice and a bottle of soy sauce. She came out of my house looking as if she had seen a midget circus. “You are out of your mind,” she told me flat out, and hopped back over the garlic to go tell her mother about the dumb laowai next door who planned on sleeping on the floor and eating raw rice covered in soy sauce. Her father, Li Guangwen, overheard and came over to hand me a cigarette. We smoked wordlessly for a minute, then he politely asked me about my origins and what I did for a living. I answered as best I could and returned the favour. He told me that his family had been living here for six generations. Months later, he would tell me the story of his Hakka ancestors and their long march from Fujian province on the southeastern coast all the way here, more than 400 years ago. Later that night, Wang Meijie sent Tiantian to invite me over for dinner. We had braised fish, sliced potatoes with red peppers and some roast duck with rice. We ate pretty much in silence. They asked how much I was paying for my place. When I told them 10,000 yuan ($1200) for a year, they looked down at their bowls. After dinner, Li Guangwen strolled over to hand me another smoke and we sat in silence as the sun set. The mosquitos rose up into the air, food for the bamboo grove bats, and the villagers retired to the corner store to gossip and play cards. For the first time in years, I saw stars above Chengdu. The winter of 2007-08 was very harsh in Flower Town. The snowstorm that ravaged southern China left trains stranded during the Spring Festival, but closer to home, it almost froze Boogie and me to death. Boogie Brown was a musician with little money and a project to finish, so it seemed natural for him to join me in the countryside for solitude and inspiration. We spent a lot of time huddled by the heater, wrapped in Tibetan cloaks we had bought in Western Sichuan years before, measuring the distance between our lips and the point where our breath disappeared. We lived off instant coffee, ramen noodles and the occasional meal scrounged up from scraps. 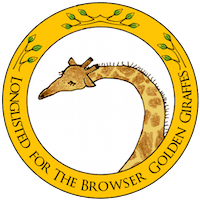 There was nothing noble, adventurous or romantic about it. Being broke in China is pretty much rock bottom, and we knew it. Every time the Nescafe ran out, I grew a little more depressed and less willing to return home to the country after a day of fruitless hustling in Chengdu. I ended up selling chunks of hashish to pay for bus rides and food. Every now and then Boogie taught an English class for a couple hundred yuan. I also taught English to a few students, sporadically. When they asked for their money back after several botched classes, I refused. Salvation arrived in the form of a friend from the US who came to visit me in the middle of February. When he turned up, I held out my hands like a drug addict, oblivious to my own shame and his shock at having to bail me out. I piggy-backed off the money he had made fishing in Alaska the summer before, trading my knowledge of Chinese for his cash-flow. I took a trip with him to sunny Yunnan, and together we escaped my cold country home for a month. Boogie met a girl and moved in with her for a while, leaving our rental empty for the frigid months of February and March. Spring was on its way when I came back in late March. Boogie was still in the city, living with a girl and making music. So I was alone when I found the doors of our empty house open and swinging in the wind. I walked inside to find dirt and garbage in the foyer, and spray paint scrawled up the staircase wall and into the second floor living area. My bedroom had the character for “fortune” (福) sprayed onto the wall and Boogie’s had “love” (爱) sprayed onto his. Somebody had pealed a peach and placed the peelings in a chalice inside the bottom drawer of a closet. I didn't find those peach peels until a few months later, after they had turned brown and slimy. The vandalism didn’t sting as much as the intrusion into our home and the realisation that I had become the “crazy cat lady” of the neighbourhood, the target of all the little boys and girls of the village. I was furious and hurt that my neighbours would do this to my home – who else could it have been? – and for days afterwards I wouldn’t speak to anyone. The next month was quiet and tense, for obvious reasons. I didn’t trust my neighbours after their graffiti run through my house, and they didn’t know what to think of the laowai who came home at all hours of the night and sometimes not at all. By then, Lhasa was burning and Kham, a Tibetan area of western Sichuan, was on lockdown. Riots in Tibet had led to a dozen police vans guarding the crossroads of the Tibetan district in Chengdu. The government-controlled media was letting everyone know that “foreign splittist elements” were trying to pry the Great Chinese Family apart. It was a tense time to be a foreigner in general, and even more so for me, in the middle of a country village with no friends, no money and no idea what the people of Unit 4 said about me during the cool spring nights at the corner store. Although no one said a word to me, I imagined their looks and whispers whenever I went out to buy something, or passed them on the way to the bus stop. There were, perhaps, other reasons for the tense atmosphere that were not apparent at the time. Scientists posit that subliminal foreshocks deep under the crust may cause birds and animals – and some humans – to act out, or flee. Did the dogs of the village bark more than usual during April 2008? Were the circling bats more frantic as the plates beneath them rubbed together and prepared to burst? Just days before the Wenchuan Earthquake, when the imperceptible foreshocks might have reached their climax, the gang of vandals that had assaulted my home while I was away stole a can of Krylon from my foyer and sprayed "Ma Shan is a Dork!” (马山是个瓜娃子) in huge blue letters right across the side of my house, using my Chinese name. I had taken a short walk to the store to grab a pack of Honghe cigarettes and some water, and when I returned the paint was still dripping. It was broad daylight, and Wang Meijie was in her courtyard hanging up clothes. She had heard the rattle and hiss of the can. She knew who the punks were who had painted up my house. Watching her shake out sheets as if I wasn’t there made me lose my mind. I whirled on her and Tiantian, and let loose with all of the invective I could muster. I took a bottle of black ink and broke it on their house. I yelled at them and told them they knew who was doing this to me, but they wouldn’t tell. Tiantian cried. Her mother defended her, searing my mouth shut with a look that reminded me of my own mother. I shrunk away back to my home, abashed at what I had said to a 12 year-old girl and her silent, shy mother. Minutes later I came out with a bucket of whitewash, and for two days I lathered paint over the offending black blotches. I never did get all of the black off their house. What happened was China's most unifying catastrophe since the Japanese invasion. I walked dazed through the streets of Chengdu on May 12, 2008. People chatted with every stranger they saw. The parks and parking lots were full of families and groups of friends, listening to the radio, chomping sunflower seeds, laughing nervously. 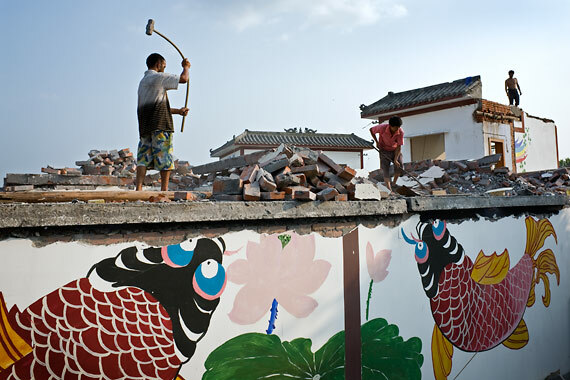 Never in all of my eight years in Sichuan did I feel more at home than during those minutes, hours and weeks after the quake tore a hole in the province and buried 80,000 people under rubble and metal and dust. I took several trips into the disaster area. I attended poetry sessions and carried water up hills. I wrote stories and took pictures. I sobbed in my room, thinking of children crushed and wailing. My house out in Unit 4 became a fortress for many of my friends in the city. 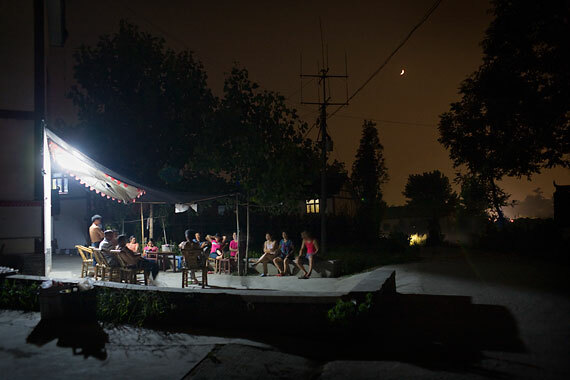 The village was 20km southeast of the city and the epicenter of the quake was 150km to the northwest, so everyone figured that in the weeks ahead, my place was the best spot to weather the daily aftershocks that rattled our ligaments and our neurons, making us all jumpy. All was forgiven between me and my neighbours now – even if Tiantian still gave me the stink-eye – and they could not contain their curiosity. Now, instead of one lone laowai with a temper problem, there were ten to twelve of us at a time. Barbecuing. Playing music. Joking and running around with the village kids. The women spilled cautiously out of their homes and came to inspect our barbecuing technique, then politely, silently, took over for us. The whole village hung out late into the night. We traded “where were you” stories with the gnarled rose farmers and iron mongers of the village, and chain smoked until our throats went dry. The kids who were most likely responsible for my house resembling a heroin hideout went back and forth to the corner store for beer and smokes. They sat around us and listened, and shared our food. A few weeks later, Secretary Luo’s blue Chery QQ came sputtering to halt in my courtyard and everything changed. Zhou Sushen’s head must be spinning. When she was little, all the pretty girls bound their feet. While she bent over day after day and pulled weeds and food from the soil, China went through the convulsions of a lunatic. Every so often she would stand up and steady her back with one hand, ankles deep in mud, and listen as the local Party Secretary rolled through Unit 4 and blared details of the most recent political campaign through a bullhorn. As the years went by, the messages of the cadres became increasingly arcane and indecipherable. Confused and trusting, she learned to just nod her head approvingly. Nobody looked convinced. Over the years, countless horror stories involving greedy developers, duplicitous politicians and desperate peasants had made the villagers nervous. Will they be compensated fairly? Will there be apartments waiting for them here when this is all finished? Will the government help them find new homes for the interim period? Secretary Luo had promised the villagers that they would only have to move elsewhere for two years, and then they would be moved back to Unit 4, to live in apartments – 30 square meters per person. In the interim, the government would pay 600 yuan per month to each family as well as a lump sum based on the value of the house. Zhou’s nephew, Li Fafu, was doubtful. The meeting took place at the house of the village head, Deng Weixin, on June 15, 2008 at 10am. Everyone seemed excited – almost playful – that morning. I had butterflies in my stomach. I was expecting a showdown between the peasants and the politician-developer bad guys over the future of Unit 4. I might even keep my home, I thought to myself, as I skipped across the fields to the sprawling white concrete house of the village head, which doubled as one of the best B&Bs in the area. Secretary Luo, his lackey Mr Zhou and six other officials sat outside the house, at a long table under a grove of plum trees. The villagers gathered in a semi-circle facing the table. Children scampered around and picked plums off of the ground, wiping them off and taking big, juicy bites. The men ringed the back of the gathering, smoking and chatting, occasionally shaking a small tree and enjoying the plums that fell. After a few minutes, the lanky Mr Zhou stood up and gave the opening speech. Murmurs rolled through the crowd and a few of the women yelled out, demanding to know the details of the payment process. Mr Li, Vice Secretary of Huayang district, the next level of government up, stood to address the crowd. He was a young man with an intelligent expression and close-cropped hair. Of all the officials present, he was also the only one not chain-smoking. “Good afternoon comrades, I am glad all of you are here for this important meeting and I am happy to be here as well. 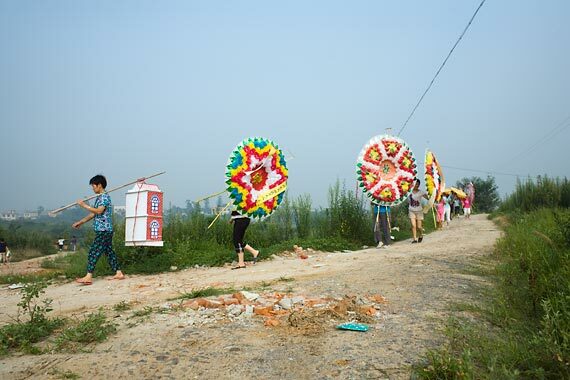 This is a very important day for Huayang, Flower Town, as well as 10,000 Fortunes, Unit 4. The government is modernising and developing this area and soon this will be a bustling center of commerce with schools and playgrounds for your children and business opportunities for your families. The city of Chengdu is developing very quickly and soon not only will the Third Ring Road be developed, but the Fourth Ring will surely be modernised as well in the coming years. 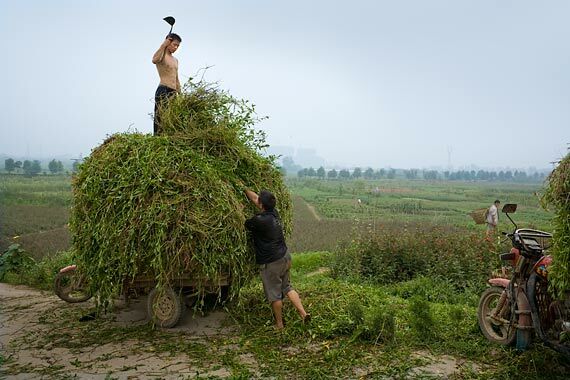 Our China is growing rich and the government is bringing these riches to the countryside as is dictated in the five-year plan recently agreed upon in Beijing. All of you will receive fair compensation for your homes and land and you will be able to live here forever in nice, modern homes provided to you by the government in return for your sacrifice. This area will become even more beautiful as modern development techniques are utilised to keep the water clean, to protect the fields and to provide electricity and even the Internet for the entire area." At the end of his speech, Mr Li gave the villagers a chance to ask questions and speak their piece. No one moved at first, then one lady rose up and started talking. Her voice shook and her face reddened as she gained momentum. “I have lived here all my life. My mother and father are old and sick and live with me too. My husband is a labourer in the city and I work in the fields. We have no money. How are you going to compensate me for losing my home? What am I supposed to do for two years while I wait for you to finish this building? How do I even know that I will have a place here in two years? I know you will change things midway. How are we supposed to live in the city with those high rents and no skills? I am a farmer. I want to know right now how much money I can get for my fields and how much money you are going to pay me each month and how are you going to guarantee that I receive my money each month. I can’t sign away my life to you. We know you officials and developers don’t care about us." The villagers chimed in with similar stories and began crowding the table. Mr Li nodded and asked everyone to calm down. I had told my neighbours before that I would speak on their behalf. All of the villagers stepped away from me and started clapping, then went silent as I cleared my throat and began. “Hi, my name is Ma Shan. Most of you know me already, but for those who don’t, I am the only laowai who lives out here and I have been here for about ten months. I moved out here because this area is beautiful and peaceful. I love living here. I have come to know my neighbours and you have all taken me in as one of your own and treated me very well. When we heard that the village was going to be torn down it was a great shock and also a big disappointment. All over China places like this are being torn down to create apartment blocks and to make way for the city. The real China is disappearing. There is no place for anyone to go and see the beauty of this country anymore because the cities just keep growing. Is it really necessary to tear this place down and make another city? I must tell you, even though I am now the only foreigner here, many of my friends have moved across the way into Xingfu Meilin and they love it there as well. Many of my artist and musician friends are moving out here. There is great potential for tourism here if we can just maintain what we have and keep it pristine and natural. If you develop this place, you might regret it in a few years when this becomes just another dirty, crowded city suburb. My neighbours love this place and this is their home. I urge the government to consider maintaining 10,000 Fortunes as it is and focusing on tourism and bed and breakfast revenue, focus on the artists that want to live out here. I hope you can keep the environment here as it is." I faltered and went silent. I realised halfway through that my arguments were senseless and falling on deaf ears. Not even the peasants entertained any thoughts of “keeping things natural” or any hope of making money with a bed and breakfast business. Progress was a foregone conclusion and the real crux of the argument was not whether or not to proceed, but how much money was going to be paid out and when the payments would happen. The villagers clapped and cheered, but I knew in my heart that I was a clown. Mr Li got up to answer. As soon as he finished, the arguing started back up between the villagers and the officials over the terms of payment. At first, Mr Li waved them down and tried to continue, but the din grew so loud that all of the officials eventually had to stand up and yell the crowd down. A phalanx of women crowded the table and slammed their hands down, shrieking at the officials to provide details. Eventually, Secretary Luo waded into the middle of the fracas and shouted his villagers into submission. He took over from Mr Li and delivered a succinct speech, waving a sheaf of papers as he shouted. “We’ve been through this before,” mumbled one old peasant as he handed me a cigarette on the way back to Unit 4. “They talk big and promise everything, but a year from now the money will be gone. Then what are we supposed to do, huh?" I shrugged, lit his smoke for him and walked back home through the rose fields. I wish I could tell you that the village banded together and marched in defiance against the bigwigs to demand justice and compensation, but that isn't what happened. We just lived out the last days. One by one the families signed their homes away, took what cash they could and moved out. They left in clumps. 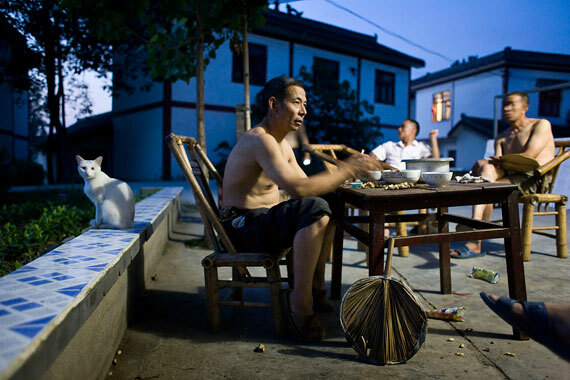 Several families moved to Luojia Alley, the outskirts of a town that itself was the outskirts of a town. The space between Unit 4 and Luojia Alley is just a jumble of overgrown fields, stacks of bricks and crumbling ruins. Other families went further out to Luodai, the old Hakka headquarters. Wang Meijie, Li Guangwen and their daughter Tiantian left for Longcuan, a larger town farther south where Wang Meijie had a sister with extra rooms. The weeks that followed the meeting filled me with the same resignation that permeated Unit 4 since that first day when Secretary Luo had backed into my courtyard and swept the future away with a wave of his hand. As July rolled in, I learned I had a job working for a security firm in Beijing during the Olympics. I had been trying to get hired for months, and I was happy and relieved to finally have some gainful employment. If I took the job, I would miss the bitter end of Unit 4, when the bulldozers would finally come and destroy the village where I lived. If I didn’t take it, I would go hungry and miss the Olympics. There was no hesitation at all. I was in Beijing for two and a half months. I scalped tickets, watched Serena Williams play tennis, and got paid. Near the end of August, I flew back to visit my old home, to see what had happened. I had moved most of my things into a new apartment in Chengdu before leaving for Beijing, so going back was just indulging my curiosity. I pulled into the courtyard of my old house late at night. The headlights of the yellow cab illuminated a gutted building and piles of scrapwood. Unit 4 had become a dark world of shadows and scavengers. I saw two men with flashlights come stumbling out of my front door. One had bits of rope and string in his hands, the other was carrying two baskets of broken metal and wood. I saw one of my flip-flops in his basket. I saw the drawers of my old closet – the one with the peach-peel filled chalice in the bottom drawer – and a mattress I had left behind. As I looked around at the destruction the night looters had wrought, my chest grew constricted and cold. 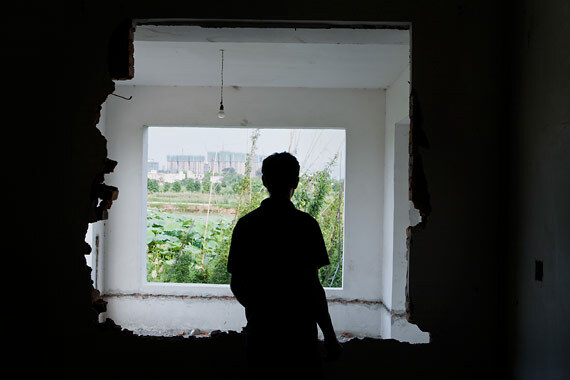 The windows of my old home were Wang Meijie's gouged out eyes; the doors, tattered frames half stripped of nails swinging in the wind, were fading memories of children screeching as they played. Sunlight on a guitar string. Wisps of long black hair. A cigarette. Li Guangwen washing his motorbike with a toothbrush. Drinking with Li Fafu. His laugh. Roses. Lamplight on a gathering. Today, Unit 4 is one large fallow field. The small pond where herons used to skewer frogs is filled with mud and dirt. A few puddles belch out mosquitos into the humid air. The rose fields that once surrounded us have given way to weeds and scrub. Yellow foam padding lies piled up where my house was, and a few bowls and bottles speak of the squatters who gather here at night, still scavenging the ruins perhaps, or just drinking under the moon. 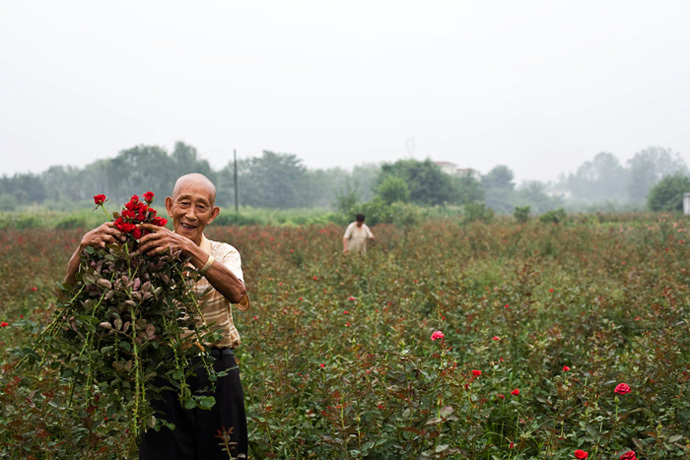 Li Zhongwen, one of the elders of the village, tills the fields were his house once stood. He grows “bashful plants”, so named because if you poke them, the leaves curl in on themselves. He sells the plants for 0.8 yuan a piece at the local flower market, and harvests onions and greens for his home. “The government isn’t doing anything with this land,” he told me in July 2012. “So we’ll keep tilling it until they make a move." My old neighbour, Li Dongmei, sits in her living room two years after her home was torn down, and looks at old pictures with me. She tells me that the monthly stipend of 600 yuan ended two months ago. She was promised a lump sum of 15,000 yuan, but it was split into three payments. She has only received 5000 yuan of it so far, enough to pay for a year's rent on her current place, above a small convenience store a few blocks down from Unit 4. I wonder out loud why a rich developer would need to split such a small sum into three installments. She raises her head and I see that the thought had never occurred to her. When we talk about Unit 4, she is forgetful, irritable, indifferent. She is more interested in my life. Where I work, how much money I make. We go through the rest of my old pictures from Unit 4 and then wait, in silence, for me to finally take my leave.